Whew! After 30+ hours of intense labor, it is done. Ladies and gentlemen, friends and fans, we are proud to announce the rebirth of our foyer. Where to begin? First, I must explain the problem. The staircase was natural blonde oak. Dated and dreadful. NOT the first impression I ever wanted to give my guests. What was a girl to do? Replacing it with European style iron railing was the cost of an automobile. Fixing it seemed too daunting. Then I saw Rhoda at Southern Hospitality blog stained her entire oak staircase a lovely dark shade, from top to bottom, and it planted a big seed in my inquisitive brain. If Rhoda could do it, surely I could too. That same week I was watching one of my favorite classics ‘Cat on a Hot Tin Roof’ with Paul Newman and Elizabeth Taylor. If you can take your eyes off either of them, which is almost impossible since they’re both practically perfect physical specimens, you notice that they frequently descend the incredibly beautiful staircase of Big Daddy’s plantation home. When I saw it’s espresso dark railing, white balusters and base, it was true love. I had to have it. So yet another seed was planted. After Rhoda, Paul and Liz, I was completely inspired. Off to the home improvement store I went, daring myself to do the impossible: transform the oak monstrosity into something sophisticated and stylish. Step One: After all the prep work, taping off the balusters and laying down carpet protection, I stripped the existing varnish off the staircase with Klean-Strip. It was nasty, smelly full-of-chemicals stuff. I had to ask Mr. CG to keep the kids away for an entire day. I wore a mask, and the fumes gave me a bad headache. And I still had to sand afterwards. (See this follow up post on why I now use Citrustrip instead). Step Two: Sand, sand, sand, then sand again. I spent about 4 hours just sanding until my fingers cramped and refused another stroke. Step Three: I cleaned off the sanding residue with wet wipes, then stained the upper hand rail with Minwax Gel Stain in Walnut. This is a wonderful product which I had used before to redo the highboy dresser in the entry. It’s not Minwax’s fault that I wasn’t satisfied. It’s just the nature of oak. It’s such a grainy wood. When the stain was applied to the oak, it gave me too much of a stripe-like effect. Darker was much better, but the product only took me half way to the look I desired. Step Four: I did something unconventional – I glazed the wood with two coats of semi-opaque Burnt Umber acrylic craft paint. Yes, you heard me right. Craft paint. I know purist wood refinishers are absolutely appalled, but I’m telling you, the semi-opaque craft paint filled in the gaps and gave me just the espresso finish I wanted. See the difference after one coat? Yessir. These were the three products that gave me the look I desired. Minwax Gel Stain in Walnut, Burnt Umber semi opaque craft paint, and Minwax Wipe On Poly. Using the glazing effect with the semi-opaque watered down craft paint (about 1 drop of water to 1 tsp of paint) helped to preserve the visible grain of the wood. Step Five: With the help of a dear friend, and professional painter, we primed the bottom of the stairs with oil based primer, then finished it with two coats of ‘Swiss Coffee’ oil based white paint for durability. Thanks Mike ! Step Six: To the upper railing only, I applied one coat of Minwax Wipe On Polyurethane. This took maybe 20 minutes total. Pour a few drops on a sponge, wipe on, and you’re done. It was dry overnight, apply two coats! I hope you’re all encouraged to take action, and transform your oak into something classic and wonderful. Yes you can! For the full story on how we ripped out the carpet and installed hardwood, look here. Update March 2012: The staircase railing has held up all these years even with two kids and their friends up and down those stairs, it works! Everything looks beautiful!! You all did an amazing job. Love & blessings from NC! I have to feature this some day soon! That before was ho-hum, but livable. That after? Absolutely breathtaking fantastic. This is hands down my favorite of your re-dos. Absolutely stunning. I admire your guts for being willing to take it on. But take it on you did. Gorgeous. Such a beautiful result on the bannister. The white balusters with the dark railings is very dramatic and elegant. Oh wow, what a marvelous change! Your 'new' staircase looks absolutely stunning, and I have to say you're one of the most talented people I know! Ah, who says blondes have more fun?!? This looks fab, makes me want to re-do mine – but where oh where do I stop! Absolutely gorgeous!! Looks amazing! You've done a great job! Professional! Love the change. 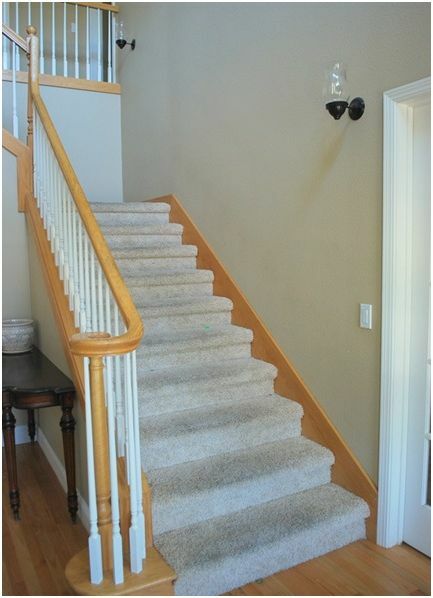 I restained my blonde FLOORS last year, and have LOVED the results… stairs were way over budget. You may have just given me the inspiration to DIY!!!! Oh my word! That is absolutely stunning! Hats off to you for 30+ hours of work! Whoa!!!! That is so gorgeous!!! You did a terrific job! Love the wallpaper treatment and the dark stained railing. It looks fantastic! Its incredible, as usual. Can't wait to see part 2! Such a great update and so creative. Beautiful, thank you for sharing! It's fabulous! What a lovely affect it's had on your foyer. Hmm … perhaps I should give this idea a try. Kate, it's truly gorgeous!! I love how you did all those steps. I cheated with mine & took the easy route, but WOW, oh WOW, yours is just magnificent. Thanks for letting me share with my readers too. You're the best! Oh, and the wallpaper, love that too. Can't wait to see the new grasscloth either. I'd love to use that somewhere. OH MY GOSH….my stairs look JUST LIKE that, even the same little u=shaped landing thingy. I LOVE it. thanks to you, Paul, Liz and Rhoda, I have a new dream!! I want mine to look just like that! Oh my goodness I cannot believe it. FABULOUS!! I am IN LOVE with what you did with your stairs, and already showed my husband one of our fall projects for the stairway. Thanks for always being an inspiration. I saw your reveal over at Rhoda's blog this morning and it made my jaw literally drop! It's absolutely unbelievable what you've done to transform your staircase and entry! This may be my fave CG project. I love it! Now I want to find a staircase to makeover. Darn the apartment living. Do you think the owners will mind if I do something to the outdoor staircase? Probably so. Very beautiful!! I love how you did the wallpaper and moulding on the sides. Can't wait to read more about that! This is just the kick in the pants that I need to redo our foyer. I have a similar project in front of me, but our whole staircase is original wood (and very, very dark). I want to paint the trim white just like your staircase, and I think it will make my foyer look so much brighter and open (just like your's). Thank you so much for the inspiration, it is just gorgeous! wow wow wow. so GORGEOUS! Congratulations! Good morning Kate, I came over from Rhoda's blog (love her blog too) and the transformation is stunning that you made. It is one of those OMG moments… LOVE it. Love, love, love it!!! Worth all the blood, sweat and tears! Could you explain what you mean with glazing? Did you just apply the craft paint over the stained wood or did you dilute it with something? Did you sand the base before painting it white? Bland to grand is right! Insanely wonderful!! Came over from Rhoda at Southern Hospitality's blog and I wanted to tell you what a great job you did on her banister and stairway. It is just beautiful! I'm curious though if you could get a similar look just by painting it (rather than stripping, sanding and staining). She's a beauty! Love it! WOW! my jaw is hanging open! it is beautiful! you should be so proud!!! you deserve to brag about this FOREVER! Wow, congratulations! It looks so beautiful! "But it's oak! "…If I hear that one more time!Yeesh! Like it's sacred or something! If it's gold…I'll still want to paint it! ;) LOVE the dark wood!!!! I was quite "Victorian" in my younger days and I still love the dark wood!! AMAZING job!!! I live just south of Rhoda in Prattville, Alabama and came here via her post this morning! I've just added you to my list of Favorite Sites and will encourage my readers to visit here as well! Your staircase rocks!!! And yes, it looked horrid haha BUT very typical. You've given it such an awesome makeover and I cannot wait to come back and take time to read each and every post on this blog!! OMGOODNESS!!! I LOVE it!! You are the makeover queen! Can't wait to hear about the wallpaper treatments, too, those really give it a nice finish!! Truly stunning. I recently acquired an oak pedestal table and four chairs. I'm definitely doing the table in that deep espresso stain, but what do you suggest for the chairs? I've thought about a white/espresso combo, but I'm not sure. Thoughts? You did an awesome job!! You make anything seem possible!!!! Faaaubulous transformation! What a difference it made!!!!!!! Congrats :0) I know you are thrilled! I love love love the dark color, and am totally impressed that you thought to use craft paint. Brilliant. Love it all and cannot WAIT to see your process on the wainscotting. I've been coveting wainscotting in our dining room and am waiting with baited breath. It's official, you are a genius!! Truly, it's stunning, and I'm beyond impressed. The craft paint is brilliant, and surely no one else would have thought of that. Gorgeous!! And, PS – I think almost all oak needs transformed. Once we painted our dining room set (an appalling honey oak), I decided this was my new mantra – If I dont love it, paint it. these pictures alone are inspiration to get moving! Hi Most Centsational One! I found out about you over at Rhoda's blog! Oh, my goodness! What a beautiful transformation you've made in your stairway area! Your railings are gorgeous and the wall! Oh, you're too good!! Thanks for all the info on how to do this! I know I will be coming back to see you! F.A.B.U.L.O.U.S. I love high contrast with dark timber and white. Oh my GOSH you have COMPLETELY floored me! I love love LOVE the use of the wallpaper, and the banister is perfection. WOW! You've completely given me hope on my light colored oak cabinets!! Great job! GORGEOUS!!! I am still picking my chin up from my desk!!! Okay…no joke…I've been planning to do the EXACT same thing to my honey oak railing (and adding white wainscoting on the wall leading up the staircase). Thank you sooo much for the great tips. I'm sure I'll be doing a post once mine is completed – although, I have a few projects to complete before I tackle this one. Thanks again, your staircase looks gorgeous. Really beautiful… and brave! The wainscoting is pretty fantastic too! Found you vis Southern Hospitality… I'll be back to get a better look around. Hey, Katie! Hopped over from Rhoda's blog! Wow!! This is awesome! We need to call Southern Living magazine and see if they will go out to CA and do your before and after!!! Beautiful job!! Can't wait until tomorrow!! Kate, I hope you're enjoying all these lovely comments because they're so well-deserved. And thank you for being so honest about all the time this took – that was a huge investment on your part but it certainly paid off. 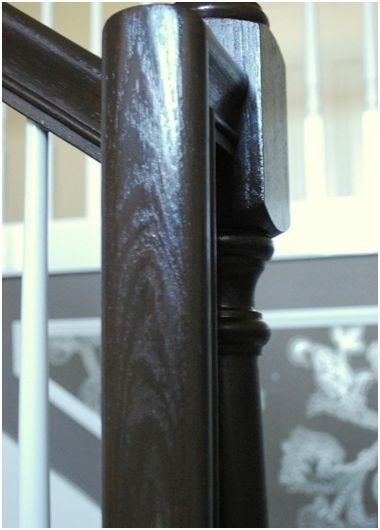 I have kind of the opposite problem – my banisters have been painted (yes, painted)a nasty dark brown and I'm itching to do something about them. Your 'before' picture really is not so bad! Amazing, that's all I can say. I can't believe you did this all by yourself! You're awesome! I for real actually gasped at the "after" photo. What a stunner! I am so freaking impressed! It is gorgeous – love it! seriously. amazing. What an beautiful job you did! You are so brave and very talented! I love it!!!!! Quick question about how you stripped the railing? What did you use on the tight areas on the curved areas of the railing? I've heard a toothbrush works in the crevices, but it didn't work the best for me. Any advice? That turned out beautifully! You are so darn creative! it does look great and i love that bit of wallpaper right there. That is gorgeous, and the EXACT color I've been trying to get my hand me down entertainment center to be! Good thing I'm not a purist wood refinisher, because I'll be mimicking your idea. Thank you! That is FABULOUS!! Thanks for the inspiration, this is EXACTLY what I've been wanting to do to my stairwell!! Fabulous transformation!!! You did a fantastic job. Fantastic! Amazing and inspiring transformation! It looks AMAZING! You are turning your tract home into a one of a kind! If I had a stairwell, I would do this! I almost can't believe it. It's so beautiful! GREAT JOB!!!!!!!!!! It was a lot of work but looks like it was more than worth it. AMAZING!!! I love it!!! and I am in the middle of rethinking my own stairs, so this couldn't have come at a better time! This looks great! Thank you for sharing! I have light colored floors and want to stain my railings as well.. my husband could not see it with the light floors so I sent him your pics! Great job! WOW! It looks AMAZING! I was irrationally excited to discover I have the same OB candle sconces as you. I bet I won't ever be able to walk by them again without thinking of your blog. Hello Kate – oh my, what a beautiful staircase make-over! Just fabulous. Can't wait to see how you did that gorgeous wallpaper design! You are such an inspiration. WOW!!! This staircase is absolutely GORGEOUS! I am so jealous of your talent! WOWIE! You did an incredible job. Even though 30 hours sounds like a long time, you did so much in that time! It's amazing. This is absolutely incredible! The transformation is leaving me speechless. I can't wait to read about your wall treatment tomorrow. Awesome! Can't wait to see part two! That is freakin' beautiful! omgosh…amazing! I have been wanting to rip the carpet off my stairs and paint them. You've inspired me! Beautiful! 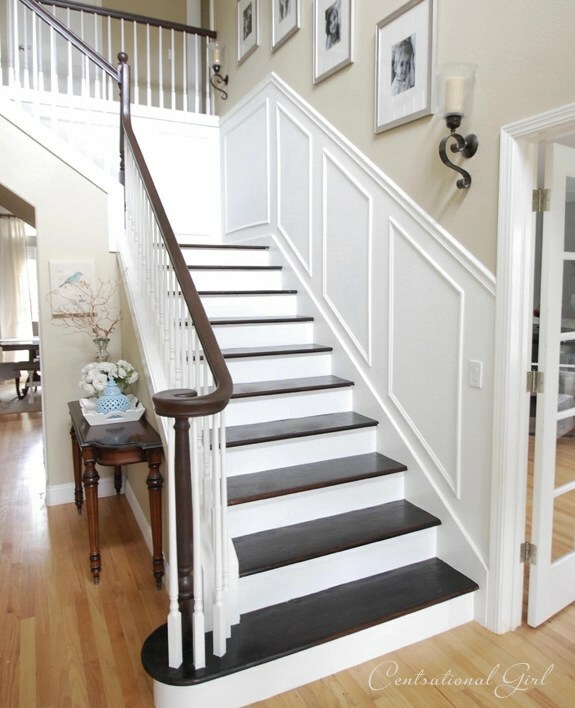 I love that dark stain and the white paint and I love the wall treatment you did in the stairway as well. It all came together perfectly! OMG, one word. Rad-i-cool. You're a better woman than I. ;) Never in a million years would I have attempted that monster of a project. The wallpaper…maybe. Can't wait to see the how-to. Excellent job. YOur transformation is AWESOME – totally! I adore the look of what you did. YOu are talented. Can't wait to see tomorrow's part II. looks awesome! And I love that you framed teh wallpaer. I love it. It doesn't even look like the same house! I love that you used craft paint. No high end, "professional" concoction but an item that anyone might have on hand. Fabulous! Love the wall treatment too. Definitely worth the 30 hours! Hi! I gasped when I saw the transformation! Absolutely stunng! I check in with your blog every day, thank you for sharing your projects in great detail and those beautiful pictures too! OH MY GOODNESS! Talk about fabulous! Great job! Absolutely stunning and wasn't what I expected at all – you went all out and your 30+ hours of work was totally worth it. That is incredible!! Your hard work definitely paid off! Holy cow that is freakin fantastic…I can't believe how amazing it looks. That was a daring project. I LOVE THE TIP ABOUT OAK WOOD. I hate refinishing anything oak. um… I have no words! Amazing! Absolutely gorgeous. I've been playing with the idea of refinishing my blah staircase and you've just given me more inspiration. I LOVE what you did. It looks amazing. Can you please come to my house now and work your magic?? I can't say much of anything that hasn't been said but that's rockin' cool. I am looking for a house right now so if I find a house with stairs, this page is book marked for future reference but now I can see possibilities rather than "ugh". I want stairs…LOL…so I can do that too! AWESOME! You are so talented! I love love love it! hey, sorry if this ?? was already asked (i can't seem to read thru 119 comments 2 find it): what is in your 'highboy' in the entry? that space, w/ window and mirror, looks EXACTLY like mine, altho my entire entryway floor is TINY. it's always caused problems but i'm always looking for the perfect pc of furn to go there. wondering what PURPOSE it serves so maybe it would work for us. ? thanks! bee you tee full work! Oh my word. Gorgeous. Love it. I am going to send this link on to a couple peole I know who would love it. On the other hand, I want to shoot myself thinking about all that work! Way to stick with a project. i just used regular old black paint on mine – rustoleum and they look great, i didn’t have to go through all the trouble of sanding and stripping. no problems here. Great Job , it is very rich looking amazing job the hard work and hours are well worth it. My stairs are prettty much like your old look. My husband & I are going to tackle this project thanks for all your pictures and detailed steps. I hope I can get all the same supplies in Canada. your staircase looks amazing!! would you recommend the same treatment on ugly oak cabinets? Absolutly Beautiful. What a difference! OK… i saw your post the day you posted it, and have been looking for it EVER SINCE! the second i got out of the site, i couldn’t find it again.. and i bet i have thought about it EVERY. DAY. I am SO HAPPY to have found it.. and i showed my husband.. i THINK he is almost on board.. Your stairwell is nearly identical to mine in style! You did a beautiful job! I absolutely love this transformation. I plan on doing this with my dated oak banister. Couple of questions. Did you use wipe on poly is Satin or Gloss finish? Also, what kind of finish did the glazing give you, and why did you only use poly wipe on the top of the banister? Thanks so much. I am super excited to start this project. It will completely transform our foyer just as it did yours. Gosh. Absolutely love the transformation. I have staircase exactly like yours before the makeover. I wish I can pull this off. Is there anything else other than the Klean strip that I can use? I’m sold! I want to do this right away to my staircase. Question: Do you know if the gel stain/varnish remover from Home Depot will work just as well to strip the varnish? Has any of your “bloggers” tried another product to strip the varnish successfully? 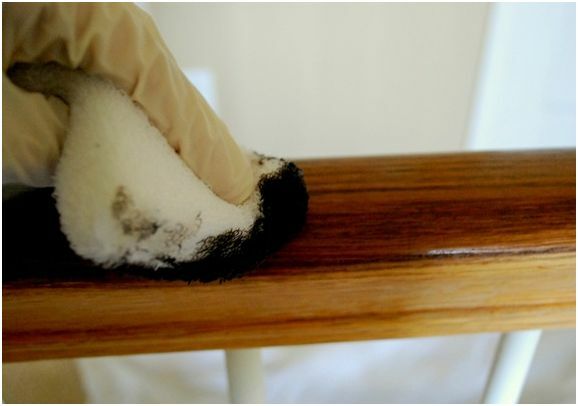 Wow, love the dark stain-it could be in the movies!LOL You’ve given me alot of inspiration to try the picture frame molding up my stairs- Can’t wait for the finished project! I am about to do the same to my railing…this is exactly what I am trying to achieve!!! I had hardwoods put in on 1st floor and carpet on stairs removed, wood stair treads finished same color as floors but didn’t have them put my railing back in so I could finish it. It is in the garage, stripped and sanded and ready for stain. I bought the Burnt Umber acrylic paint & wipe-on poly minwax (oil-based). However I keep reading online that if applying poly over acrylic, I should use water-based poly because water & oil don’t mix…..**Have you seen any peeling over time/durability issues? 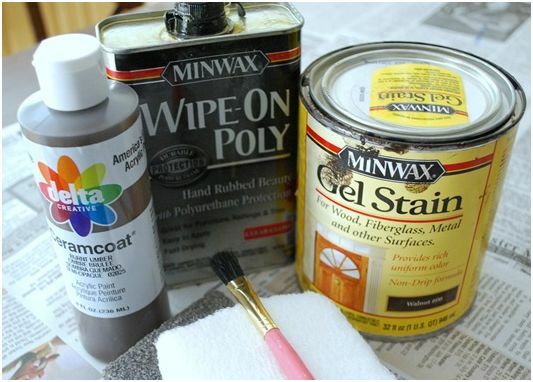 **If none, did you lightly sand acrylic before applying the one coat oil poly? I just finished staining our baby cradle with a walnut stain. I hate it. It is blotchy and awful. So I was thinking of doing what you did with your acrylic paint. I was just wondering if you add stain on top of the acrylic paint or if you just put on the wipe-on poly…thanks? Could you clarify? I want to do it right. This is the best diy stair makeover i have seen! I was truely inspired by this, so much that when I saw it, I decided I would redo mine too right then and there. My staircase is stripped, sanded, and stained (2 coats). Now I just need to apply the Burnt Umber and the Wipe-on poly. How did you apply the acrilyc paint? Wipe, sponge, brush? And did you mix it with anything or just applied it straight from the bottle? And how long did you wait to apply the poly? I need you’re help, I have my huge project on pause! WOW. I saw this and immediately started the project of the railings. (actually I hired someone) but had them do exactly what you did. WE are almost finished and it is amazing. I am soooo glad you shared your entire process. Looks great. This is very inspiring and I have been looking to do something like this since I moved into my home. I did a google search and found your fab site. This is now my next project to tackle in my home. I did want to know what you used to protect your carpet. As I have nearly the same stairs I’m concerned when painting the white that might ruin my carpet. Any suggestions? I’m having so much fun checking out your site. Hi CG! First I just want to say I stumbled upon your blog and am now completely hooked. I have been dabbling in refinishing old pieces using paints and stains and it is starting to become quite a passion for me. You have given me some great ideas! We are suffering from the same blond oak banister that you had. My first fall/winter project is going to be painting the spindles white and staining the handrail. I just wondered if you have any tips for painting the spindles and also for keeping the paint and stain off of the carpet. Eventually I would like to have wood stairs too but it’s not in the financial cards right now. Any help you can give would be great! Thanks for all of the inspiring ideas and keep up the great work! I have been admiring your stair banister for so long and have finally gotten the nerve to do the same! We also have the ugly honey oak which looks really bad with our new Brazilian koa wood floors! So I have applied the gel stain walnut color and it is not dark enough so I bought some of the burnt umber acrylic paint. My hope is that you could provide me with some details of how to apply it. How many coats of gel stain should i use before applying the burnt umber? Any additional advice or help would be appreciated! Thank You!! Hey Jamie, it did take a long time! I used that small brush to add the glaze all around the litle crevices but a larger brush would work just fine! I am so interested in this. I saw your other post with pictures and it looks fabulous, but the pictures aren’t showing in this post…… Thanks. I want to try what you have done but your pictures are not coming up on this page. Did you take them off? I love your stairs and want to change ours from the awful honey finish as well! Our house is 20+ yrs old and we are the 2nd owners with 3 active boys so we need to do something! Hi Kara Anne and Jennifer, this post is one of about 20 that needs repair – I’m working on it and will get it fixed shortly, so sorry! I’m a new reader to your blog & you’ve given me tons of inspiration! I just bought a house that I honestly didn’t want because of all the honey oak throughout it’s entirety. (WHY?!) The first thing you notice in our home is the honey-colored stair banister/balcony that takes up so much space. Well, I love our house now, (minus the never-ending honey cabinetry.) I also can’t see these pics, but will keep checking back because I love the “after” pics of your stairwell and I can’t wait to get started! My husband and friends think I’m crazy, but now I have proof it can be done. Will fix it by Friday, so sorry Melody, it’s part of a series of posts from 2009 that lost images, will get it repaired soon! Interested in seeing the photos, but they are not showing up? Thanks for the photos! Just moved into 25year old home with golden oak banisters can’t wait to get working on them! I’m so inspired by your creations! I’m going to be doing the same thing on our staircase, only leaving the carpet on the stairs! This is a HUGE INSPIRATION! My only question is how were you able to paint the wood molding on the wall side with the carpet intact!? Did you have to remove it somewhat, paint, then replace the carpet? Hey Elizabeth, I simply taped it down then when I was painted, pushed down the carpet even more with a trowel, worked great! This is absolutely gorgeous. There was a time when I would have done a project of this magnitude…but not anymore. Wonderful job! 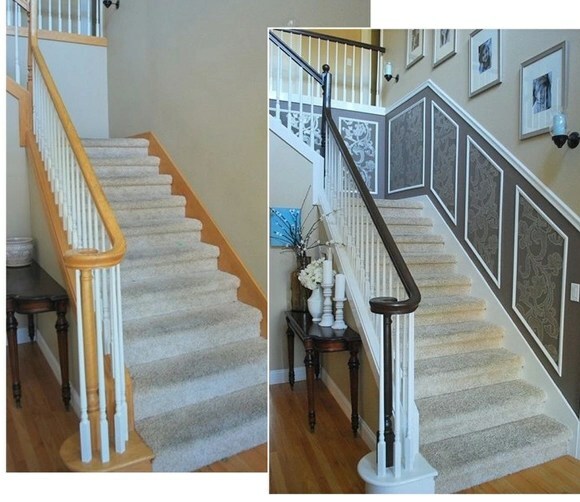 Would you now recommend the same stain you used on the stairs for the railing so you would not have to use the craft paint? I love the look! I am inspired now that I see that you can do the stairs and not all the floors at the same time. I thought I was going to have to save up and have it all refinished at the same time. Thanks for the inspiration. Great question Jessica, I would have used the Duraseal on the banister had I known about it! The glazed banister is holding up well though, those coats of polyurethane sealed it. Duraseal is mostly available to the trade but I believe there are online suppliers too. I tried the antique brown and did my banister with that. I want to do my cabinets too but I feel antique brown is too dark for my cabinets, any idea what could give a chocolate brown color. This is so gorgeous! I plan on doing the same thing following your awesome blog step by step. 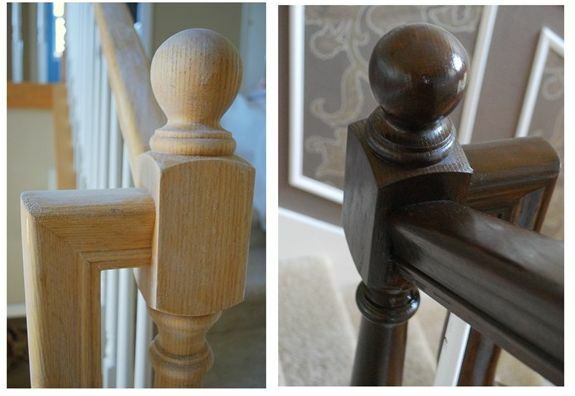 One question.. how in the world did you sand all the small crevices on the banister? There were’nt to many crevices on the banister just the railing’s top and underside. The balusters were previously painted white so I left them alone! Great Looking stairway. General Finishes gel stain (you’ll have to google to find in your area) gave me the same look. I did my kitchen cabinets which were oak and no stripping necessary. Used a little liquid sander to dull existing finished. I would like to know how hard it was to lay the wood on staircase and where you got your suppllies for it. Love your blog. I recently used Rust Oleum Cabinet Transformations in Espresso for my kitchen. Do you think that kit would work on an oak banister? It looks almost identical to what you had. This is an opinion question. I, too, have honey oak banisters. I also hav hardwood throughout including the stair treads that are ALL honey oak. Staining the floors is more of a professional job and out of our budget right now. Would it look totally strange to do ONLY the banisters and treads in this espresso finish? I love it, but not sure how it would look with the rest of the floors still in honey. Advice/opinions, please!! Hi Rebecca, I used to think they should match but now after living with it for over a year, I don’t even notice. I think it’s okay to have two wood tones in a space, makes it interesting, push it to three and there’s confusion. Of course there’s always exceptions, but I don’t think your floors and treads have to match at all – go dark on the stairs! Hi Diana, I don’t recall it’s been so long, but a few coats of wipe on gloss polyurethane gave it a nice shine! I was wondering what is the paint color on the walls? I love it! Your stairwell looks amazing! I was also wondering what the paint color is on the walls? Hi Kristen, all of the paint colors in my home can be found by clicking the button in the sidebar! How did you contain all the nasty dust? I see you have high ceilings…. I do too, and am having a HARD time w sanding, dust, kids! Thank you so much for this tutorial. I redid my banister and I just love it so much. I also used the acrylic paint and it turned out perfect! Wow Becca so glad to read this! I am trying to achieve the look of your gorgeous stair rails. You are calling the acrylic craft paint “semi-opaque” glaze… is that because you added a drop of water to a teaspoon of paint? I used that same formula, but it is going on as a solid brown acrylic paint. Did you simply brush it on and leave it to dry? Thanks! Hi Gracie, mine was watered down so it went on like a glaze but I used two coats as I recall. It shouldn’t be completely opaque, it should have some transparency to it. Hi there! This may sound like a weird request, but the doorway seen at the foot of the stairs – is it a single doorway or a double/french? I ask this because I am looking at adding a door to my formal living room to make it an office that can be closed off, but my doorway is a double with a stair banister in half of the doorway – if that makes any sense. I was considering removing the banister and putting a wall up so that it was just a single door entry – but I am not sure if it is going to look good. I also have a 2 story foyer. Hi Kristen, that’s a set of double French doors – I have a single door opening to my office. I want to know the paint color for your walls?! Please! Nothing to do with the staircase – that creme, light color – i want it! what is it?! Hi Kay, all of the paint colors in my home can be found through the button in the sidebar ! I’m sorry, I’ve been looking and cannot find anything! Would a direct link be too much to ask? 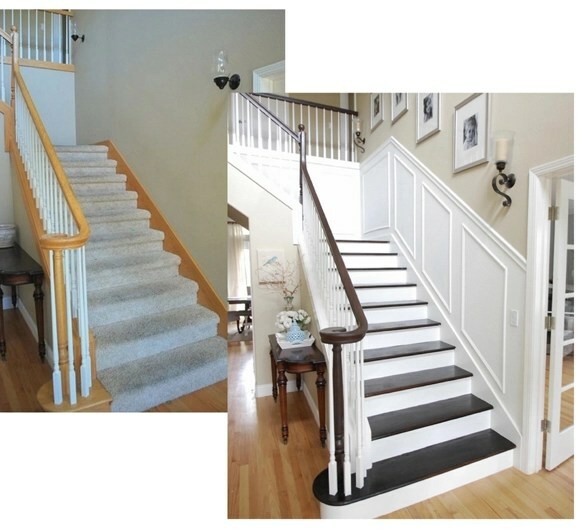 Love the transformation…I have been telling my husband that we should change the oak to dark stair treads and railing…we have light oak hardwoods at the top of the staircase and the landing in the foyer is a white = greyish marble…. his concern is that it wont match the lght hardwoods in the two rooms to either sides of the stairs or the second floor hallway …. and your pic shows how great it matches! What is the height of your chair rail? I’ve been scouring your site for the dimensions, but don’t see it. I like the scale of it to the staircase and frames. Thanks!